When musing upon the topic of pastels, we invariably imagine one of two items: cotton candy or Easter eggs. YAS! dear readers, the images that come to mind are sweet foodstuffs and odd seasonal rituals, neither of which is exactly known for being the epitome of what's pronounced stylistic. But these immediate associations are finally being challenged, thanks to a fresh yet powerful look from Proenza Schouler's S/S 10 show and the intriguing interpretations of said style, as seen on lovely's like Ashley Olsen—pastel hair. GET FAMILIAR. Olsen, unsurprisingly, was one of the first fashionable celebs to try a hint of pastel highlights. 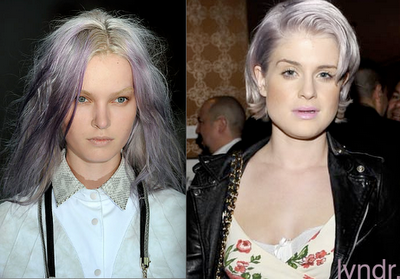 (To clarify, we mean this time around, obviously loads of ladies have rocked this look throughout the years.) Just a couple of months after the Proenza Schouler show, she arrived at the MoMA's Second Annual Film Benefit, wearing a 'pepper' of blue and purple strands in her hair. While Olsen went for a subtler look, Pixie Geldof ramped things up for the ELLE Style Awards in London last month when she showed off a head of minty hair. Geldof often tweaks her hair color, so her statement-making pale green coif was definitely not as surprising as Olsen's look. 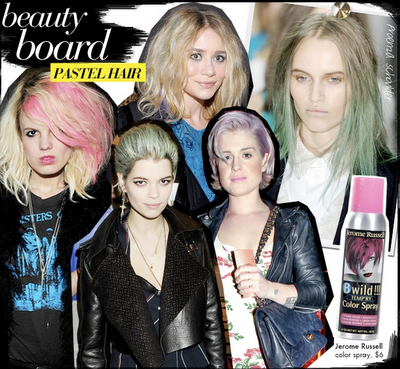 Also in the bold color choice corner: the queen Kelly Osbourne with her lightly lavender locks. You've got to love the look!